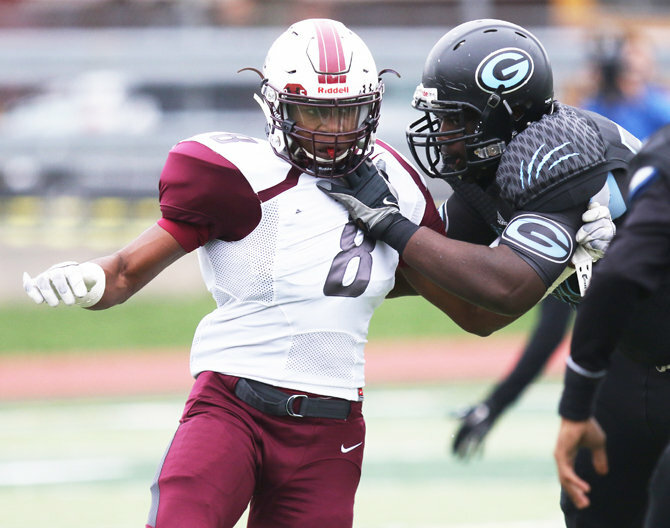 I've blogged about 2016 commit Leon Flanagan two times before. Flanagan gets a mention in this article. This article from October 29th features Flanagan. Bob McGovern on why Saturday was UMass' best win four years. Hustle Belt's last regular season power index has UMass as #10. With not enough 6-6 teams to fill all the bowl slots, Buffalo might still get a call. ESPN predicts the bowl matchups. The MAC Championship will be Friday at 8:00 PM. Toledo HC Matt Campbell was hired at Iowa State yesterday. Campbell will get $2 million his first year. After grinding out a blog post seven days a week since August, I'll be dropping to the off-season schedule of no Sunday posts, unless something big happens. Syracuse beat Boston College to drop the Eagles to 3-9 (only one FBS win). Lots of sub-plots to that game. The Orange fired HC Scott Shafer after only three years. I wonder if Don Brown will make a bid to coach there. He has a history of moving around and it's a Northeast job, which he prefers. In addition, perhaps UMass can poach some of Syracuse's recruits. The Orange have three-star verbals from a pro-style QB as well as 6-3 240 pound TE. Temple crushed UConn. If the Owls win the AAC's championship game, Temple could be the highest rated Group-of-Five team and play on New Year's day. Stanford kicked a field goal with one second left to knock Notre Dame out of playoff contention. Colorado dropped to 4-9 with a loss to Utah. Colgate withstood a late rally by New Hampshire to win at Durham in the first round of the FCS playoffs. Great win for the Minutemen yesterday. Instead of living with a loss for the next nine months, we get finish out with a win and something to build off of. The revamped OL did an excellent job with Josh Bruns at RT. Dan DiNicola played most of the game and played well. Marquis Young, who should win his second Gold Helmet Award, ran for 240 yards (6.9 yards/carry). That's the most single game yards in fifteen years (Kevin Quinlan ran for 241 against Northeastern on 10/07/2000). Blake Frohnapfel, who was playing hurt this year according to Rene Ingoglia, scored the game-winning TD by using all of that 6-7 height to score the winning TD at the end of the first half. Tajae Sharpe has a critical reception to keep that final drive going. The defense played strong all day. Trey Dudley-Giles actually had two INT's (one was taken away by a real bad call from the Field Judge). And you know that Joe Colton had to tip that late INT to Da'Sean Downey (who make a smart football play by hitting the turf) to seal the win. Matty Vautour says it was an emotional win for the Minutemen. Matty says Buffalo didn't recruit Marquis Young. Blake Fronapfel praised the makeshift Minutemen OL. Dan Malone says the Minutemen held on late. Dan reports the Buffalo win eased some of the pain of 2015. Bob McGovern says the Minutemen ran over the Bulls. 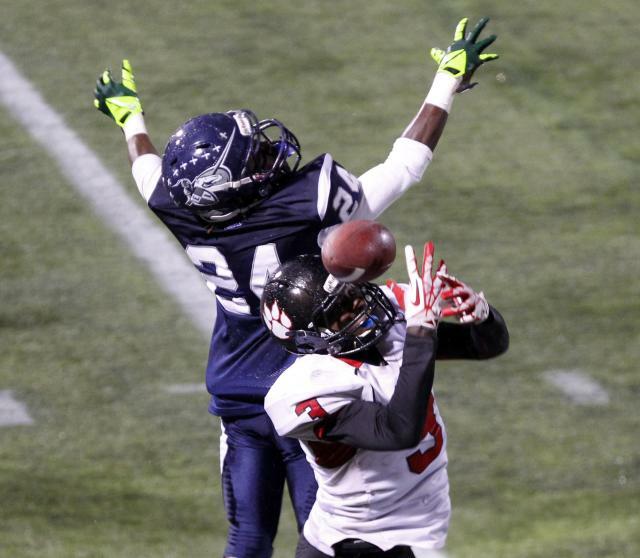 The Worcester Telegram says Marquis Young led the Minutemen to victory. The Boston Herald says UMass leaves the MAC on a high note. The Niagara Gazette says the Bulls missed a chance to play in a bowl game. Rotoworld comments on Marquis Young's 240 yards. Western Michigan beat Toledo. That should knock the Rockets out of the Top-25 and cost the MAC a New Year's Day bowl game. Like everything else this year, today's game is going to be a tough row to hoe, Only two days of practice and the injury situation should make the Minutemen a fairly large underdog. The Bulls have turned the ball over in recent games. If UMass can get some momentum, maybe we could get the upset. It would certainly be a morale booster to the team and us fans. I'll be watching and rooting for the Minutemen. UPDATE: Dan Malone has how to watch today's game. Joe Colton is subject of this essay by Bob McGovern. The game will be live on ESPNU. Matty Vautour reports UMass may be without Blake Frohnapfel and Randall Jette. Buffalo blog Bull Run simulates today's game. The Buffalo News previews the Minutemen-Bulls game. The Buffalo News also says the Bulls defense needs to step up. The Niagra Gazette says Buffalo needs a win to be bowl eligible. With only one win over a team with a wining record, the Bulls may not be picked for a bowl anyway. #24 Toledo tries to avoid an upset by Western Michigan. Happy Thanksgiving everyone! I'm thankful for Mrs Blog, who puts up with my UMass obsession. I'm thankful I got to see UMass kick off against Notre Dame. Next year I'm hoping to the Minutemen kick off against Hawaii and at the Swamp. Hey, it's been a tough year, but I'm thankful we're playin'. Off blog, I've met a number of UMass fans and former players this year. Hope all UMass, coaches, fans and players have an excellent holiday. 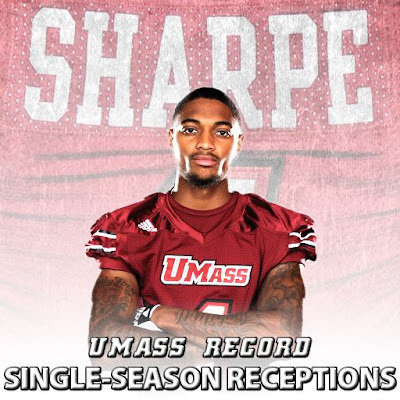 Matty Vautour report Tajae Sharpe reflects on his UMass career. Julian Talley worked out for the Patriots. Matty Vautour also has a post on Talley. Buffalo is playing ten players in its defensive line rotation. Cleveland.com previews this week's MAC games. Victor Cruz joins an exclusive fraternity with the release of his signature shoe. MLive picks Buffalo over the Minutemen. CBS Sports says take the under in the Buffalo-UMass game. University of Buffalo has a new A.D. Yesterday I posted a couple of links going on about how great NIU is in November. The Huskies promptly lost to Ohio last night. That loss may knock NIU out of the MAC championship game unless Western Michigan upsets Toledo. After a 23-year stint as HC at Maine, Jack Cosgrove is leaving. They're really suffering over at BC Interruption. Sony Michel, the brother of Marken Michel led Georgia to an overtime win over Georgia Southern. Victor Cruz was honored at a YMCA event. James Ihedigbo was benched against the Vikings. UMass has the game notes for Buffalo up. The Berkshire Eagle says the Western Mass HS playoffs should be at McGuirk. That's actually a pretty good idea. If the UMMB could make an appearance, maybe UMass could show some people who haven't been to a game, what the experience is all about and gain some fans. Buffalo will appoint Allen Greene to its vacant A.D. position. NIU looks to clinch a spot in the MAC title game when the Huskies play Ohio. USA Today says Northern Illinois has a system that's hard to beat. Sports Illustrated looks at the teams in contention for the FBS playoffs and concludes Notre Dame is still in. 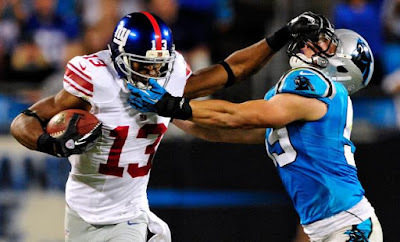 How Victor Cruz absence is affecting the Giants. News Day says the Giants have a tough roster decision to make about Cruz. 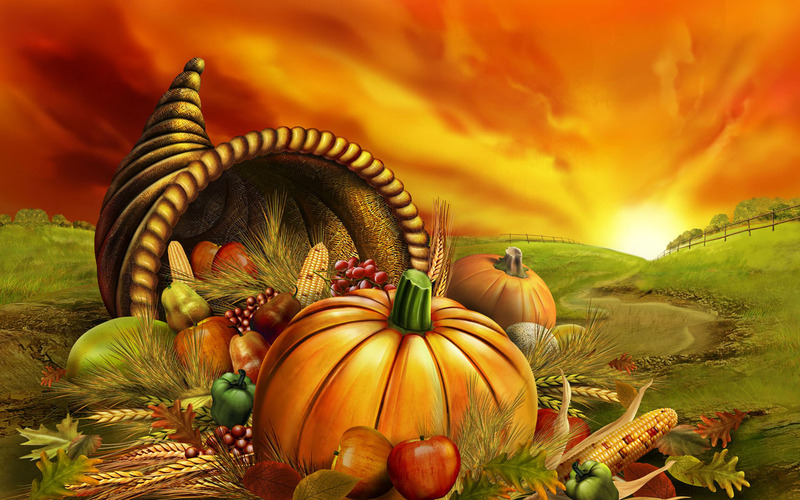 It's Thanksgiving week. As of 6:45 AM, neither UMass or Buffalo have their game notes up. Bob McGovern report the Minutemen fell flat during their last home game. Three turnovers figured heavily in the Bulls loss to Akron. Buffalo also lost their A.D. to UCF. Vegas has the Bulls by 6 over the Minutemen. They have Temple by 12.5 over UConn, Notre Dame by 2 over Stanford, Utah over Colorado by 15.5 and BC (!?) by 4.5 over Syracuse. Keepers College Football rankings has Buffalo by 10.62 over UMass (.htm download). NIU continues to dominate the MAC. The Chicago Sun-Times say NIU is becoming the Mr. Football of November. Toledo regained a spot in the AP poll at #24. Notre Dame is #4 and Temple is #25. The Coaches poll is roughly the same, but Toledo is first in the "others receiving votes" catagory. What a star-crossed year this has been! I've blogged several times about how UMass stayed healthy during our 1998 Championship. Yesterday, and I'm not making this up, the person side of me said "Where's the rest of our team?". I too was waiting for a bunch more players to exit the locker room. It looked like the Miami (Ohio) traveling squad had more players than UMass did. The only remaining suspense for this year is if UMass will have 48 players to take to Buffalo. Still lots of support for a 2-9 squad. You have to wonder what the attendance would be if we had a winning team. The Minutemen will finish last in the MAC East. Dan Malone says the Minutemen were offensively challenged. Dan says the seniors came up short. FIU was crushed by Western Kentucky. Temple rebounded to beat #21 Memphis. Notre Dame survived 5 turnovers to beat BC 19-16 at Fenway. Hey, we still have one more FBS win than the Eagles. A big red sky here in Jaffrey at dawn, but the weather at McGuirk is supposed to be partly sunny with a high in the mid forties. In late November, that's pretty good for New England! UMass should be getting some players back after last week's game. The return of Marken Michel should help spark the UMass passing game as the Red Hawks won't be able to blanket cover Tajae Sharpe. Another big day from Marquis Young and Jamal Wilson should help too. I'll be there cheering for the Minutemen. UMass will honor the Minutemen seniors as well as football alums from the 1970's and 1990's today. Dan Malone previews the Minutemen-Red Hawks game. 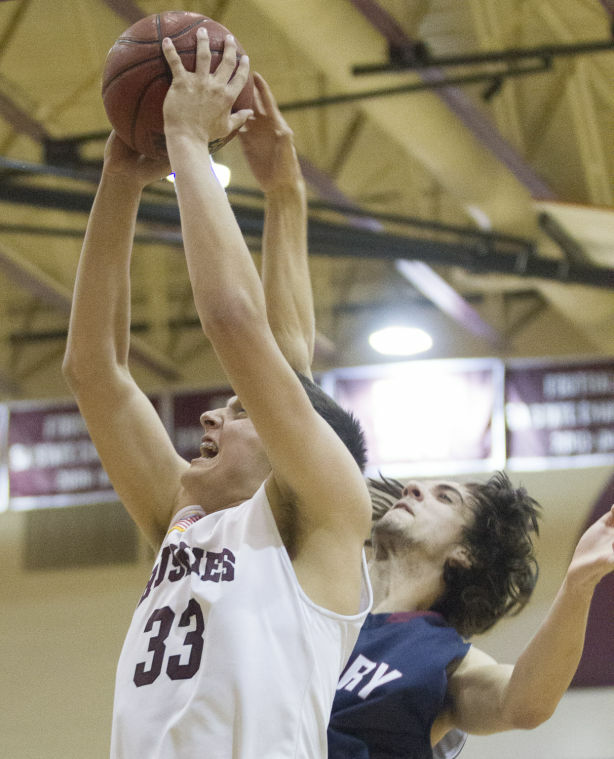 Matty Vautour says UMass hopes one win will beget another. Bob McGovern on the Zen of covering college football. The Dayton Daily News previews UMass- Miami (Ohio). Akron and Buffalo play for bowl eligibility in today's only other MAC game. Colorado plays #24 Washington State. FIU plays Western Kentucky and if they win, the Panthers will be bowl eligible. Temple has not been the same after getting physically beat up by Notre Dame. ESPN says Fenway Park is being converted into Notre Dame's home field. Matty Vautour reports UMass seniors look to go out on top. Matty notes three of the 26 seniors: Khary Bailey-Smith, Jalen Williams and Bernard Davis will have a year of eligibility left. Coach Whipple says Miami (Ohio) is a very resilient team. The Miami Student says Red Hawks WR Sam Martin and QB Gus Ragland will not play due to injuries. Martin had a big game against the Minutemen last year. The Student also has Miami senior superlatives. 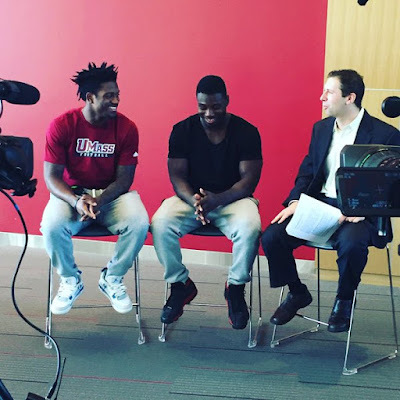 Jordin Rinard and Michael Traini of Hustle Belt preview the Red Hawks-Minutemen game. The Toledo Blade says right now, the Rockets are in the MAC's catbird seat regarding a bowl bid. The NY Post says if your think Victor Cruz's NY Giants story is over, you don't know him. CBS NY says you can't help rooting for Cruz to return. 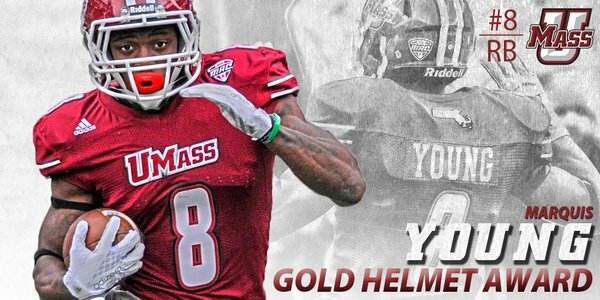 Marquis Young was named the New England Gold Helmet Award winner for his 168 yards against Eastern Michigan. Matty Vautour reports that Coach Kellogg is planing on contacting UMass freshman QB James Sosinski about walking on to the hoops squad when football is finished. The UMass Daily Collegian says UMass football looks to apply "energy" to the Miami (Ohio) game Saturday. Bob McGovern says Red Hawk QB Billy Bahl (good name) is the player to watch for Miami (Ohio). NIU beat Western Michigan last night to take control in the MAC West division. NBC Sports says Victor Cruz could be done as a NY Giant with his current contract. Miami (Ohio) has their game notes for UMass up. 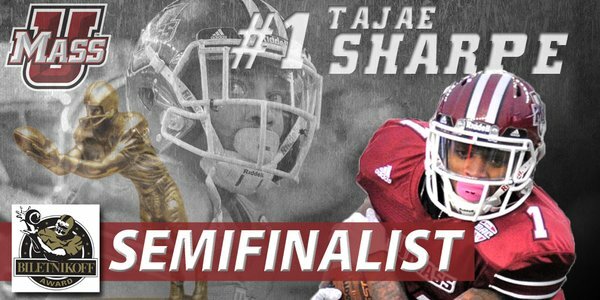 Tajae Sharpe has been named a semi-finalist for the Biletnikoff Award. Sharpe is currently #3 in the 10 semi-finalists! Vote early and often. CBS Sports says take the "under" in the Minutemen-Red Hawks game. MLive picks UMass over the Red Hawks. Legendary coach Paul Brown quarterbacked for Miami. Miami (Ohio) did a patriotic look uniforms for Military Appreciation Day against EMU. Sometimes it's good to wait. I thought of predicting Bowling Green over Toledo in last night's game based on how good the Falcons' offense has been. Kareem Hunt ran for a 158 yards and the Rockets cruised to a 44-28 win. Tom Coughlin on Victor Cruz's future. "Fans" have ripping Victor on social media. UMass has it's game notes for Miami (Ohio) up. Red Hawks HC Chuck Martin's Monday video interview. CORRECTION: Our Fri., Nov. 27 game at Buffalo will be played at 4:30 p.m. and will air on @ESPNU. Change made by @MACSports. Set your DVD if working or Black Friday shopping. Dan Malone wraps up the win against EMU. Dan reports Randall Jette is day-to-day for availability for Saturday. Hopefully, we will get some of the five starters who sat out the EMU game back. Sports Chat Place breaks down the UMass-Miami (Ohio) game. Victor Cruz will have surgery on his calf injury, which may end his career with the Giants. Why Victor's contract may cause him to be released. Tonight will be the final UMass Football Radio show of the season. I was just noticing how deep into the roster the Minutemen went at Eastern Michigan. Dan Jonah (1 career catch) started and played most of the game as the "Y" receiver. Jordan Hamilton (2 career tackles prior to Saturday) played the whole game at one corner. Jesse Monteiro made his first start. Jackson Porter also played in the Minutemen secondary. Hamilton had 8 tackles and a FF. Sha-Ki Holines had a good game on the D-line. He 2.5-14 TFL a SACK and one QB hurry. Jamal Wilson and Marquis Young will be on this week's UMass Insider. UMass' big rushing total against EMU jumped the Minutemen from #125 to #107 in NCAA rushing stats. Marquis Young is #25 in the nation with his 6.19 yards per carry. EMU linebacker Great Ibe was named Walter Camp FBS defensive player-of-the-week for his 21 tackles against UMass. Dan Malone reports UMass opened as a 9-point favorite over Miami (Ohio). An interesting line is Ball State by > 7 points over Toledo. Memphus is a 1.5 favorite over Temple. Notre Dame is 16 over BC and Western Kentucky is 14 over FIU. All the odds here. Keepers College Football Rankings has the Minutemen by 7.62 (.htm download). Toledo moved to the top of the "others receiving votes" in the AP poll. Temple's loss knocked them out of the Top-25 in both the AP and Coaches Poll. Jesse Monteiro and Zeke Edmonds did most of the work at safety. 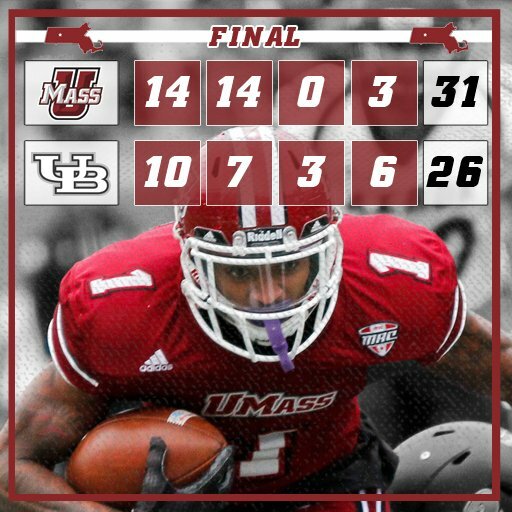 Marquis Young 32-178 5.2 AVE and Jamal Wilson 16-112 7.0 AVE ran over the Eagles and won the game for UMass. UMass' write-up on the game. Dan Malone says UMass snaps a losing streak. The Daily Collegian says the Minutemen rushing attack lead the way. Grant McPherson of the Gazette says UMass ground down the Eagles. Hustle Belt says the Eagles were left without a home win. Temple lost to USF and will probably fall out of the Top-25. USC squeaked by Colorado Friday night. Wake Forest was all over the Irish in stats, but Notre Dame won anyway. FIU was dismembered at Marshall. Hopefully, the Minutemen are in a better space regarding injuries than they have been over the last three games. UMass just has to keep grinding. This has been a star-crossed season for the Minutemen and their fans. Nothing good is achieved without sacrifice and effort. We have to keep working and the results will come. I would really like to see the Minutemen win today to give the team, the coaches and not the least, UMass fans some reward for all we've been through. Matty Vautour reports UMass needs to win today to feel a little better about the 2016 season. Dan Malone previews the Eagles-Minutemen. Dan scouts the Eagles by the numbers. He has media availability information here. The MAC website spotlights Coach Whipple. Akron-Miami (Ohio) is the only other MAC game today. Bob McGovern reports Jaquan McCullough a 6-0 180 pound WR from Erie Community College is receiving interest from UMass. He's also the cousin of current UMass RB Marquis Young. "Since leaving high school, McCullough has been working hard at his craft. 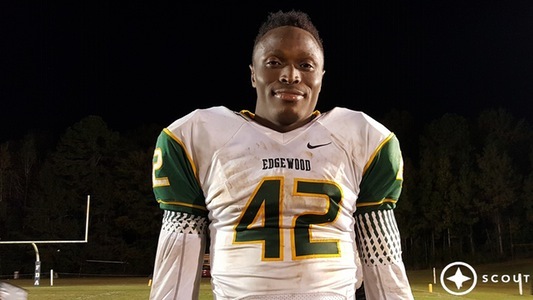 It is his main focus as he looks to find a division one home to play college football. ”I know that I need to improve on speed,” McCullough said. “I’m working on preparing for real game situations as a receiver. But like I said, just improving my speed and my jumping ability. I know I’m good at route running. I’m still working at it, but speed is my main factor to improve on. McCullough ended up at a JUCO because of the type of HS he attended. Also receiving interest from Buffalo. 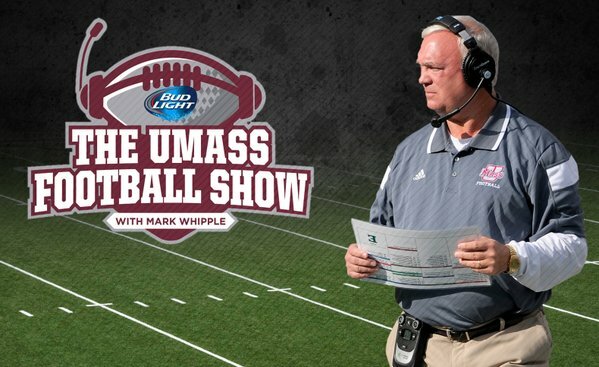 Matty Vautour says UMass looks to run against Eastern Michigan. Andrew Cyr reports the Minutemen are looking to score against Eastern Michigan's struggling defense. A MAC team will play in the Poinsettia Bowl. The MAC team may be matched with a Mountain West team. Notre Dame plays Wake Forest. BC, losers of six straight gets a bye week. UConn also gets a bye week. Joe Colton and Logan Laurent are National Awards candidates. Worth mentioning is Colton is also a MAC academic award holder. Dan Malone has a post on Colton and Laurent. Bob McGovern says Whipple is focused on consistency. He also has a post on Colton and Laurent. Eastern Michigan will have a contest for students to throw beanbags in a container from 10 yards away to win a year's tuition. Lots easier to do than a 40-yard field goal. EMU kicker Dylan Mulder has been nominated for the same award as Logan Laurent. NIU beat Buffalo last night. Bowling Green beat Western Michigan to win the MAC East title yesterday. Marken Michel's brother Sony Michel is playing for Georgia with a broken hand as well as hip and groin issues. Yesterday was Veteran's Day and I missed this inspiring story about Marine veteran James Halford walking on at Indiana. In yesterday's post on James Sosinski's possibly joining the UMass Hoops squad, Matty Vautour reports Marken Michel's injury situation has improved and Tajae Sharpe is back practicing. The return of Sharpe to full speed and and the possible availability of Michel would sure help the offense. Keepers College Football rankings has UMass by 6.97 over Eastern Michigan (.htm download). He has Temple-South Florida essentially even. Notre Dame by 30 over Wake Forest and USC over Colorado by almost 17. The UMass Daily Collegian says Eastern Michigan is an opportunity for the Minutemen to gain a win. The Eastern Echo previews the Minutemen vs the Eagles. CBS Sports says take the under in the UMass-Eastern Michigan game. MLive picks the Minutemen over Eastern Michigan. It was close, but Toledo knocked CMU out of the MAC West race last night. Ohio shut out Kent State. Army's loss to Air Force gives the MAC another bowl slot. Don't look now, but Notre Dame is #4 in the College Playoff rankings. EMU has their game notes for UMass up. It's Senior Day for the Eagles. UMass' game notes for EMU. UMass hoops is down to eight scholarship players. 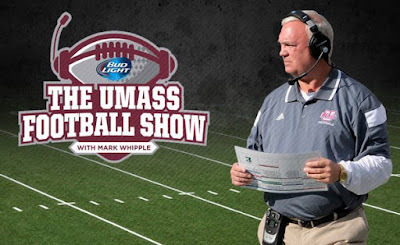 Matty Vautour says UMass FR QB James Sosinski may be asked/or may volunteer to join the squad. The 6-7 Sosinski averaged 7.4 rebounds/game in his senior year. Dan Malone wraps up the loss to Akron. Dan says the Minutemen are one-TD favorites at EMU. CMU plays Toledo in MACtion tonight. Bowling Green is one game away from the MAC East title. Congrats to Tajae Sharpe for the UMass record---and he has three games to go. Dan Malone says the Minutemen "D" got the job done, but the offense sputtered. Dan has a post on Sharpe's new single-season receiving record. Hustle Belt has the Minutemen #11 in the latest power rankings. Vegas Insider has UMass by 7 over Eastern Michigan. EMU Kicker Dylan Mulder kicked a 55-yard field goal in the Eagles loss to Miami (Ohio). Toledo's loss to NIU knocked the Rockets out of the Top-25 polls and almost out of the "others receiving votes category. Notre Dame is knocking on the playoffs door and Temple stayed around the #21 region. OK, sometimes in life your efforts are not only unrewarded, but unappreciated. Yesterday was one of those days. Did you notice what has changed over the last two games? Now that both Sharpe and Mills are both playing hurt nobody is getting separation on passing plays. Frohnapfel either has to hold the ball or force it into coverage. With its two offensive playmakers hurt, the Minutemen offense has just stalled. We threw the ball on Notre Dame and Temple. It's not like Whipple suddenly forgot how to coach or Frohnapfel throw the ball. Without our vertical passing game, our offense just does not function. We could really use a bye week to get healthy. Again, on the unrewarded side, the defense played well enough to win. UMass had only 2 penalties. I can't complain about yesterday. Sharpe and Mills played the best they could under the circumstances (as has all the other injured players this year). Frohnapfel will never mention his receivers not getting open and Whipple will not mention injuries. 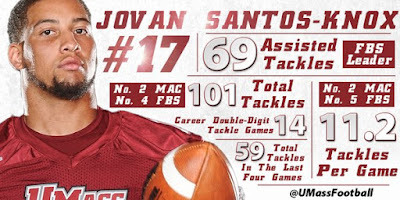 The professional media won't pick up on it either, but I think UMass getting its playmakers hurt that has derailed this season. GoZips.com writeup on the game. Matty Vautour's coverage of the game. Matty has a notebook about Sharpe setting the UMass receiving record and questions about the progress of the team. Dan says the Minutemen's comeback drive fizzled. Dan Malone has five takeaways from the game. Dan has post game video with Whipple stating he's not ready to make personnel changes. BC lost its sixth straight. Notre Dame beat Pitt to continue its playoff bid run. The weather is supposed to be partly sunny with a high of 61 degrees at Gillette----and that's about as good as it gets for November. Hope to see everyone there. Today UMass faces another good defense but offensively challenged team. The Minutemen need to score when the chances allow. We can't miss field goals or throw interceptions inside the red zone. We can't not make fourth-and-one's to give the Zips' offense a short field. A couple of turnovers by the Minutemen defense would help. Go Offense! Go "D"! Go UMass!! Matty Vautour says some wins would be consolation for the seniors. Tajae Sharpe needs five catches to break Jimmy Moore's all-time UMass single season record. Moore did it in fifteen games. The NCAA record of 155 for single season catches is held by Freddie Barnes, Bowling Green in 2009. Today's game will be nationally televised on CBSSports Channel. Dan Malone previews the Zips game. Scouting the Zips by the numbers. Ohio.com says the Zips are preparing for another aerial assault. Temple scored 60 points on SMU last night. Notre Dame plays Pitt today. BC tries to break a five game losing streak against North Carolina State. UConn is a six-point favorite over 2-6 Tulane. Senior Joey Colton reflects on his last trip to Gillette. The Boston Globe says Joey Colton still believes. UMass is #115 in rushing offense. The Minutemen are #117 in total defense. Blake Frohnapfel is #19 in passing yards. Tajae Sharpe is #1 in receptions/game. Jovan Santos-Knox is #8 and Joe Colton is #45 in total tackles. The Worcester Telegram has post about athletes in the Ashburnham Hall-of-Fame. It includes John Griffin who had a great year in 2010 for the Minutemen after transferring from Northeastern. UMass DB Trey Dudley-Giles gets some mentions in the article about Zephyhills coach Reggie Roberts Sr by the Tampa Tribune. Kent State lost by one to Buffalo last night. Ball State was blown out by Western Michigan. Toledo needs to win its last three games to have a chance to win the MAC West. The loss to NIU should knock the Rockets out of the Top-25 polls. 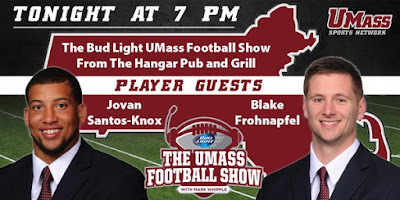 UMass football show tonight at 7:00Pm. The UMass Daily Collegian reports the UMass seniors hope Akron brings back fond memories. CBS Sports says take the under in the Minutemen-Zips game. Jerome Lane Jr has found his niche as a Zips wide receiver. Bowling Green hung 62 on Ohio last night in Wednesday night MACtion. UMass 2016 opponent fired HC Norm Chow yesterday. SB Nation gets the site of the UMass-Hawaii game wrong, but says it's a tough place to coach. College football announces the sites of future title games. CRIME IN GRANBY---IT'S OUT OF CONTROL DOWN THERE. A number of recruiting services report UMass has offered to Kelvin Lucky, a 6-6 228 pound DE/TE from Edgewood academy in Elmore Alabama. Scout.com article on Lucky here. Besides UMass, Lucky holds offers from Georgia State, Texas, Vanderbilt, Arkansas State, South Alabama, Troy and Miami (Ohio). Matty Vautour says UMass players try to move past disappointment. Joe Colton, Tajae Sharpe and Kelton Brackett all missed practice on Tuesday with injuries. Dan Malone has video of an interview with Coach Whipple. He said the Minutemen will stick with the veterans. The UMass Daily Collegian reports UMass would like to finish the season strong. MLive Michigan picks Akron over the Minutemen. NIU knocked Toledo out the unbeaten ranks last night. It probably also knocked the MAC out of a New Year's day bowl. More from Fox Sports College Football. That puts Western Michigan alone as MAC West leader. The first college football playoffs ranking of the year is out. The Victor Cruz foundation partners with the Boys & Girls Clubs to support young people's interest in Science, Math and Technology. I received a nice "Gridiron Club 2015" sticker for my truck yesterday. If you want UMass to get better, join the Gridiron Club and help Coach Whipple with the heavy lifting. Matty Vautour says Coach Whipple was not happy with the loss at Ball State. Dan Malone reports Coach Whipple believes in order to break a four-game losing streak UMass has to play a lot harder. The Zips are not much offensively, but their defense is the full package. Sports Chat Place thinks the Minutemen will cover the small spread. Undefeated Toledo meets 5-3 NIU tonight in the Glass Bowl. Toledo's Matt Campbell is rocketing up the coaching ranks. Giants fans wonder about Victor Cruz's "I am a Giant" documentary. Kansas students celebrated the Royals World Series victory by------------breaking into KU's stadium and tearing down the Jayhawks' goal posts.